What is GrandClick, Is Grandclick a Scam or Legit? What is GrandClick? Whether GrandClick is Scam or not? If you are looking for review in order to find out information about GrandClick, then you are on right Page.In our review, We will discuss about strategies to earn money in GrandClick, Upsides and downsides of GrandClick. GrandClick has been online since 2014 and the owner of the GrandClick is Mihkel Einaste. He is also the owner of the Grandmonopoly.com and TheBuxer.com. GrandClick is a Paid to click site in which you can earn money by viewing advertisement, completing offers and referring other members to the site. In our review, We will discuss about strategies to earn money in GrandClick, Upsides and downsides of GrandClick . You can earn by viewing adverisements. You can earn from 0.001 to 0.0025 dor each ad click. You will get more than 15 ads per days. They provide CPAGrip, PTCWall and videos which help you to earn more in GrandClick. You can find PTCAds, tasks and surveys by clicking on PTCWall tab. You will get cash or points for completing these offers and survey. You can also earn by playing Grid game. In GrandGrid, you just need to click anywhere on the picture and you can win up to $2 only. Whenver you click, You will get an advertiser site and you need to view it for up to 5 seconds. After that you will know you are winner or not. Standard memmber will get 40 chances daily. 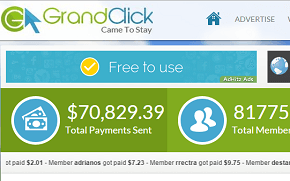 You can earn more in GrandClick by referring people to the site. You will get commison when they click or upgrade account. You will get 40% of your referral each ad click. Note: You need to view atleast 4 advertisements to earn clicks from your referrals tomorrow. All payment are made via Paypal and Payza. You can request for cashout when you reach $2 threshold. You also need to have minimum of 100 clicks, to use any of withdrawl options. In order to recieve withdraw, Paypal and Payza account must be verified. Payments are processed with in 7 days. GrandClick is new site but paying on time to its members without any issue. The minimum amount to cashout is $2 only which is fixed. They provide PTSU offers in which you can earn money by signing up on others website. These are the advertiser website, So if they approved you work you will get credited otherwise not. Most of the times they will not approve your work. So it is better to leave these offers and work on other task. If you want to do these offers, you can its up to you. There is limit on direct referral, Standard members will get only 100 direct referrals. If you want to increase the limit, Then you need to upgrade the account. They are also renting out referrals. Rented referral is not a good way to earn money because these referrals become inactive after some time and you lose money. So it is better to focous on making direct referrals. If you are inactive for more than 60 days, Your account will be removed. If you want to continue with the site, Try to login atleast for every 60 days. GrandClick is paying on time to its members for more than 1 year without any issue. There is limit on direct referral, Standard members can refer only 100 people to the site. But if they are able to get 100 active direct referrals then they can make good income with this site. Want to see #1 Ranked Online Work Program? If you want to ask any question about GrandClick, Please do leave them below. We will reply in Jiffy. Hola le saluda Alex de lima peru, mi comsulta es su opinión sobre la pagina de publicidad 99foryou,Flyligas si son fiables.Gracias.